If, like me, you love staring at the dioramas at AMNH, especially the older, more sun-faded ones, this book is for you. An engaging look at natural history museums and their changing place in our culture. From two-headed snakes in jars in a cabinet of curiosities to the modern institutions of research and education and every phase in between. Great read for those interested in history of science, museology and taxidermy. The natural history museum is a place where the line between "high" and "low" culture effectively vanishes--where our awe of nature, our taste for the bizarre, and our thirst for knowledge all blend happily together. But as Stephen Asma shows in Stuffed Animals and Pickled Heads, there is more going on in these great institutions than just smart fun. Asma takes us on a wide-ranging tour of natural history museums in New York and Chicago, London and Paris, interviewing curators, scientists, and exhibit designers, and providing a wealth of fascinating observations. We learn how the first museums were little more than high-toned side shows, with such garish exhibits as the pickled head of Peter the Great's lover. In contrast, today's museums are hot-beds of serious science, funding major research in such fields as anthropology and archaeology. 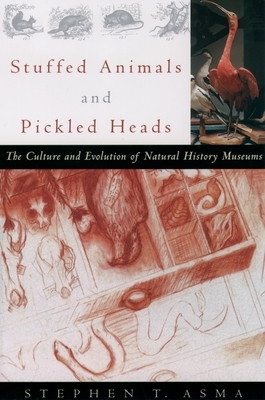 "Rich in detail, lucid explanation, telling anecdotes, and fascinating characters.... Asma has rendered a fascinating and credible account of how natural history museums are conceived and presented. It's the kind of book that will not only engage a wide and diverse readership, but it should, best of all, send them flocking to see how we look at nature and ourselves in those fabulous legacies of the curiosity cabinet." --The Boston Herald. Stephen T. Asma is Professor of Philosophy and Interdisciplinary Humanities at Columbia College, in Chicago. He has written articles on a broad range of topics that bridge the humanities and sciences, including pieces in Chronicle of Higher Education and The Humanist, and he is a regular contributor to Skeptic Magazine. The author of the bestselling Buddha for Beginners, he lives in Chicago.